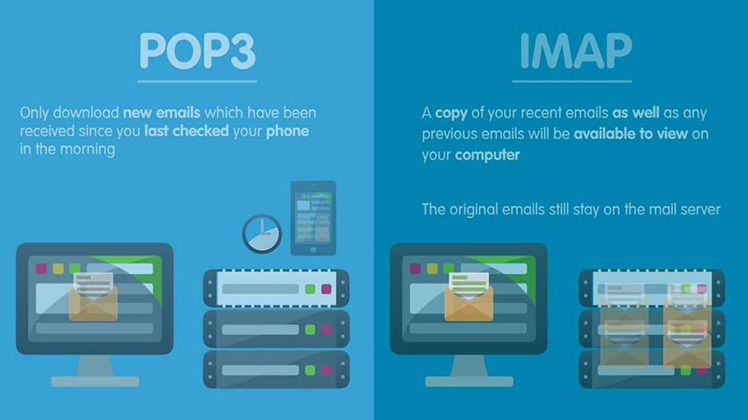 Innovern Solutions - Email: What’s the difference between IMAP and POP? Innovern SolutionsTech BytesTech BytesEmail: What’s the difference between IMAP and POP? IMAP and POP are the protocols or technologies that enable you to download email messages directly to your computer or device and then access them with the help of an email program such as Microsoft Outlook, Mozilla Thunderbird or Mail for Mac. The main advantage of email programs is that the most popular ones give you more features than when you just look at your emails on the internet. The main difference between IMAP and POP is that IMAP (Internet Messaged Access Protocol) always syncs with the mail server, so that any changes you make in your email program will also appear in your webmail Inbox. So if you're going to regularly use webmail and an email client, we'd recommend using IMAP. With POP (Post Office Protocol), your email client account and mail server are not synced. This means that whatever changes you make to your email account in your email program will not be transferred to your webmail Inbox. So, if you are using IMAP and mark a mail as "read", it also gets marked as read in your webmail Inbox. This won't happen with POP, because in this case, emails are downloaded to your computer or device and any changes you make on your device won't be reflected on the mail server. If you're switching from using POP to IMAP then you need to be aware that any local folder structure you might have set up within POP will be lost when you make the change. If you want to keep these folders, we recommend you log into your webmail and re-create them before transferring.